Given the exposure to policymaking in the Sri Lankan economy under the NCED banner, Budget 2016 is the recommended treatment that the Sri Lanka economy requires, subject to a few exceptions. But a point to note is that it sure moves us away from our comfort zone which is why the agitation by the people. Policy reforms do create ripples. The real impact of Budget 2016 will happen only if it is combined with the third generation economic reforms which were presented by the Prime Minister early last month. The reason why reforms hurt the people in a country is because they call for a behavioural change which is challenging in an already-challenged environment. But, unless we as a country accept these changes required and adjust to the somewhat out-of-the-box thinking proposals in the Budget, Sri Lanka will lose the opportunity to become marketing-oriented. The best case is the Budget proposal on withdrawing of permits to public sector and doctors, which created a wave of protests and token strikes that finally led the Government to revoke the original proposal. Whilst there is some merit to the argument, the loss is for Sri Lanka, as it lost an opportunity to put the Sri Lankan economy on track. Let’s accept it, the vehicle permits given to the public sector have become an indirect method by which the private sector adds to the remuneration package of a Government servant. A better option would be to increase the salaries of the public sector to compensate for this revenue loss but tie it to a productivity enhancement tool. Unfortunately Sri Lanka opted for the former and the loss is for the country by not absorbing the Budget proposal. This defeats the very purpose of a revolutionary budget. Let me capture one key Budget proposal that caught my attention and it will create some opposition when it comes to the implementation stage. If we absorb the shock then in the long term Sri Lanka will benefit. If not, we will once again head back to the original status quo. I guess time will tell. A point to note is that this proposal has been in the system for the last five years but different quarters have lobbied and ensured that it will not get in as a budget proposal. Once again we see the same happening on this proposal which I feel is one such reform that will help this industry be a $ 5 billion industry in the next three to five years. Liberalising tea imports: The proposal to liberalise tea imports to the country within a regulatory framework with a view to encourage value addition through blending, etc. Strict labelling requirements will be made mandatory so that the brand name ‘Ceylon Tea’ remains uncompromised. Problem: Ceylon Tea has a history of fetching the highest prices at an auction globally but if we are to sustain this in the future, one way to differentiate ourselves is by pursuing a niche marketing strategy globally so that we can cover our high cost business model. This can be ably supported by the current communication strategy that will come to play. The overriding generic communication campaign that will be unleashed by the Sri Lanka Tea Board focusing on the quality Ceylon Tea proposition, via the iconic Lion logo, can set the stage for the brand marketers to take the driving seat of brand building. But a point to note is that this is a long-term strategy and results will only begin to hit Sri Lanka in two to three years. The question asked by many is what ramifications this will have for the short-term business of Ceylon Tea. To explain this point let me take the Russian Federation as an example as it is the number one market globally for importing tea at 175 million kilograms per annum and it is the number one export destination for Ceylon Tea. If one examines hard facts and data, we can see that in the Russian market the bulk tea exports out of Sri Lanka increased in volume from 21,166 to 28,743 metric tons during a nine-year time horizon of 2000-2009. On the other hand packeted tea volumes have come down from 18,377 to 7,516 metric tons during the same period. The question is why this had happened during the sample timeframe. The reason for the shift in demand in Russia has been due to the import tax that came to effect in Russia for packeted tea by around 30%-40% whilst duty on bulk exports has been reduced to 0%. The Russian policy also orchestrated the market beautifully by introducing a labelling law to allow tea products to carry the tag ‘Ceylon Tea’ even if it contains only 51% of tea from Sri Lanka whilst the rest can be blends from other countries. The logic for this decision by the Russian policymakers was to give space for organisations to set up in Russia to pack teas that are imported from many countries for blending purposes and thereby sprucing up FDIs into the country. This also enabled the Russian Government to address the looming unemployment crisis in the country, hence a commendable economic move internally. The results were encouraging from a Russian perspective as Table 2 clearly indicates that the less expensive teas that are being imported into Russia from countries such as Kenya have increased from 5,123 metric tons to 11,821 during the time period 2002 to 2009whilst imports from Vietnam has catapulted from 4,720 metric tons to 13,183. If we want to further validate these numbers if we examine the volume of tea exported to Russia we can see that the top six exporters numbers from Sri Lanka during that time period have come down from 15,623 metric tons in 2002 to 9,346 metric tons in 2009, which is a decline of almost 40%, which is colossal in value terms. If this same behaviour is extended to the rest of the key markets like Middle East and in the future Iran, the hit to Sri Lanka’s export revenue can be catastrophic. Hence it imperative that Sri Lanka addresses this issue given that it is a business trend based on the change of consumer behaviour due to the pressure on the purse. 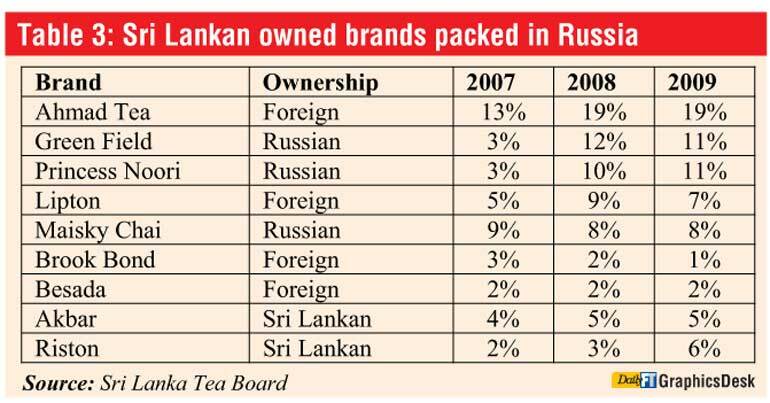 If we dig deeper, we see that Sri Lankan owned brands packed in Russia are making inroads to the Russian consumer. To be specific the brand Ahamed tea has made inroads and increased market share from 13% to 19% within just three years. As per Tea Board statistics, a brand called Green Fields has increased share from 3% to a staggering 11%, which clearly explains the challenge that Sri Lanka is up against in the global market place. Given these developments, Sri Lanka has no option but carefully evaluate the best option to develop the attack strategy. One option is to drive consumer pull and retail pull by building strong brand equity on the ‘Ceylon Tea’ proposition but linked to the branded products of Sri Lanka. This in turn will drive demand pull to brands which are manufactured with high quality single origin quality Ceylon Tea. However, the issue is that this strategy requires a very fat advertising budget which is a luxury that we cannot afford at this moment of time. A point to note is that even the current 10-25 million dollar promotional campaign will not garner enough share of voice to attract brand equity that is required to support this kind of brand pull is my view. The another option is to set up a Free Trade Zone (FTZ) where enterprises can set up blending facilities by importing teas from other origins which can fall under the Budget proposal 2016. However, a stipulation that policymakers should enforce is that 50-70% of the tea in any pack must be of pure Ceylon Tea whilst the rest can be teas from other origins. Maybe a new logo can be developed so that the packs that originate from this geographical location is different. This will enable differentiation between ‘Pure Ceylon Tea’ and the teas that comes out of the FTZ into the global market. With stakeholder consultation this business architecture can be further refined and the final concept of the tea hub can take shape. It might be painful as it’s about paradigm shift. But I will strongly urge that legislation must be done under the auspices of the Auditor General so that violators can be taken to task. Whilst this strategy may sound convincing on paper, there are many issues that can crop up when operationally implemented which is the concern of the industry which has validity. One option is for the FTZ to be a self-contained entity where a leakages will not take place to the local market. If this happens the total auction system can get affected and the ramifications to the country will be unimaginable. Given this issue raised and maybe many other issues raised in the media in the last two weeks, I would strongly advocate that we test market this concept, targeting one export country. This can help us ensure necessary checks and balances are in play. Once the test market duration is over (one to three years) an independent 360 degree evaluation must be done and the lessons taken before it is rolled out to the rest of the world. A key issue that can come up if option two is followed is that if it is not properly monitored, it can affect the current business model of tea which commands the highest tea prices at any auction. One way out is to test market this proposition as mentioned above so that we can determine if Sri Lanka is ready to implement the concept of a tea hub and its architecture. Another issue that can create an issue is the brand imagery diffusion if low-priced multi-origin tea gets exported out of Sri Lanka. One way to avoid this is by way of developing an identified new logo which will be equivalent to a second line trademark that Sri Lanka will showcase to the world. It’s not a bad idea to pursue given that we are the champions of tea globally. But once again the private sector needs to work out the detail architecture. There are other spin offs by pursuing the second option. There will be many support industries that will come into the economy, such as the printing and packaging sectors which will include the corrugated cartons business which ideally can be developed and maybe even enter the Stock Exchange, which will add value to the overall economy of Sri Lanka. The other is the employment that will get generated in the ‘tea hub’. In conclusion, the essence of this strategy that is unfolding is that we are moving away from a product-oriented quality argument to becoming a market-driven business that can take this industry to be a five billion plus business for Sri Lanka. But I agree it falls into reforming of the industry that creates hurt. The challenge is how we can absorb the shock for the sake of the future competitiveness of the industry. 1) A white paper must be must be development by the stakeholders on details of the ‘tea hub’ that includes the types of tea that can be imported and the country where the test marketing will be done with details on how the FTZ can be watertight. In essence a new business model must be stamped by the AG. 2) This idea must be debated at the highest policy level at the ministry end on a private-public partnership platform in line with the Budget proposal submitted. 3) Once approved by Cabinet, the new business model must be sketched out with a detailed game plan and clear time horizons with specific robust export targets agreed. 4) When the project is in place, close monitoring must be done and corrective action taken on the run whilst at the end a 360 degree evaluation activated not only in Sri Lanka but also on the tested export market. 5) I would suggest a brand equity study and a U&A study be also done in the test market to determine any harm that can happen to brand equity of Ceylon Tea. 6) Post the research results being debated, the lessons learned must be captured and included to the master plan of the Sri Lanka Tea Board.